The tamarind is native to tropical Africa, but many other tropical areas of the world cultivate it. This leguminous tree was introduced into India for such a long time, that’s why it has often been reported as indigenous. Also referred to as Indian date, it is classified as both a legume and a fruit. 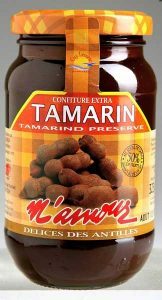 In Guadeloupe Archipelago, the tamarind’s name is Seaside Tamarind. This name comes from the fact that you find tamarind trees along volcanic sandy beaches. This tall tree is a long-lived, medium growth, bushy tree that can attain a maximum crown height of 12 to 18 metres. The tamarind tree can withstand drought conditions quite well and is highly wind-resistant because of its strong branches. The tree is a beautiful spreading crown that casts a light shade. 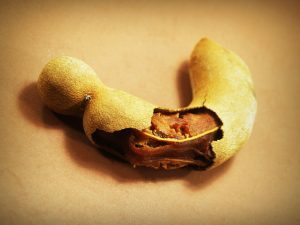 The tamarind fruit is a brown, curved pod between 8 to 20 centimetres long containing from 3 to 12 large, flat, glossy, black seeds and an acidulous pulp. When still slightly unripe, it has a very sharp, sour taste with a high level of acidity. When fully ripe, the shells are brittle and can be easily broken while the pulp dehydrates to a sticky paste. The pulp has a pleasing sweet/sour flavour and is high in both acid and sugar. The fruit is a staple ingredient in various cuisines around the world especially Indian and Mexican. Many people use it in savoury dishes but also in sweets and jams. The paste is a major component in many marinades, sauces, desserts, drinks and even chutneys. The fruit is an excellent source of vitamins C and E as well as B vitamins (B1 Thiamin, B2 Riboflavin and B3 Niacin). It is also rich in minerals calcium, iron, magnesium, phosphorous and potassium. As an excellent nutritional fruit, it is high in antioxidants and has multiple medicinal properties. For instance, important levels of vitamin C make tamarind, a good way to boost your immune system and fight off harmful bacteria and viruses. Eating tamarind fruit can improve your digestive health and relieve constipation. Furthermore, consuming the fruit encourage weight loss, reduce blood pressure and improve nerve function. If you are pregnant, the juice might help to reduce morning sickness. People are using the bark, root and leaves for traditional home remedies as well. For instance, the leaves relieve inflammation, pain and swelling. In Guadeloupe Archipelago, the pulp is used to do jams, juices, syrups and punch (mix of the fruit juice with rum).